Joey Barton believes Fleetwood Town have a golden opportunity to make more history by reaching the fourth round of the FA Cup for the first time. After despatching two non-league clubs, Town’s League One rivals AFC Wimbledon now stand between Fleetwood and a place in the last 32. Town reached the third round for only the fourth time in their history courtesy of Monday’s 2-1 win at National League North club Guiseley, when Paddy Madden and Wes Burns scored and all three goals arrived in the space of five first-half minutes. 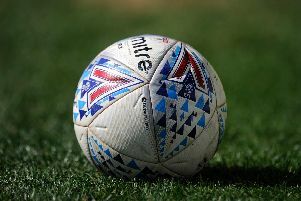 Having lost their first-ever third-round tie to Blackpool in 2012, Town have reached that stage in the past two seasons, taking Championship side Bristol City and then Premier League Leicester City to replays. Town were underdogs in those games but won’t be against second-bottom Wimbledon and Barton is relishing the chance to earn a potential clash with one of the big boys in round four. In a fixture quirk, Town were due to visit Wimbledon in the league on the third-round weekend. Barton is anticipating a Saturday, January 5 date for the tie and says FA Cup prizemoney provides “lifeblood” for clubs below Premier League level. The Town boss said: “The FA Cup is massive. I don’t know the exact financials because it is not something I care about but no doubt Steve Curwood (chief executive) and Andy Pilley (chairman) will know the ins and outs of it. It is a life blood for clubs like us. “The money that comes into Guiseley’s coffers from our game will no doubt help the football club. “Maybe at the top levels it is looked at slightly differently, but certainly for Guiseley and the lads from lower down the cup is lifeblood ... also for us. “It is key for us to get in the third round and see where we end up. Can we get a nice Manchester United away? I don’t think anyone wants to play Manchester City! But you know there will be a lot of people in the stadium and it is great for our lads to test themselves against world- class, elite-level players.